Even from a really young age, children love puzzles of any kid and develop a fascination with them, trying their best to figure them out and solve them. So picking one of the best puzzles for 2 year old kids as a gift for your toddler could be a very wise choice. I still remember my first ever puzzle as a toddler and the fun and excitement I had trying to work out which piece went where! And the sense of satisfaction and pride I got when I eventually completed the puzzle was awesome! Puzzles for two year olds play an important part in their development as they help them to improve their problem solving skills, critical thinking, hand-eye coordination and more, all while having great fun! So we’re delighted to share with you our list of the top puzzles for a two year old toddler which have been thoroughly researched and vetted to make life easier for you. We’re certain you’ll find the perfect gift for your precious toddler! If you are looking for an intuitive and colorful way to teach your toddler about numbers, alphabets, colors, and more, then the Melissa & Doug Classic Wooden Peg Puzzles (Set of 3) is the perfect pick for you and your little one. Perfect for 2 year old children, this puzzle is designed to get your adorable toddler ready for school by introducing them to numbers, letters, and colors. Featuring vibrant colors, solid wood construction and illustrations that your adorable toddler will adore, this delightfully illustrated 3-in-1 vibrant educational puzzle is ideal for helping to develop your child’s number, letter, and color recognitio. It is also excellenting for helping your child develop their pre-reading skills as well as their hand-eye coordination, visual perception, and fine motor skills. 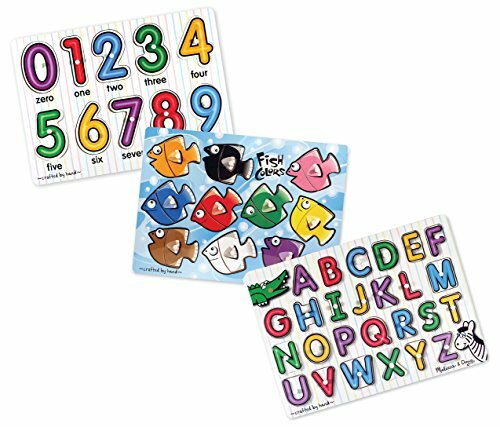 This educational puzzle is a 3-in-1 combo that comes complete with a fish puzzle designed to help your little one learn and match colors, a number puzzle that helps to enhance number recognition and counting skills and an alphabet puzzle that effectively develops your child’s letter recognition and pre-reading skills. With these brightly colored peg puzzles, you can help you and your cute little one develop an even stronger bond as you teach them to add numbers, play guessing games and unleash their storytelling skills. Several parents who bought this puzzle for their children said they were surprised at the educational and social benefits, as it not only helped their little one become more expressive, recognize colours, letters, and numbers, but also helped speed up their learning process when compared to other kids who didn’t use this puzzle. 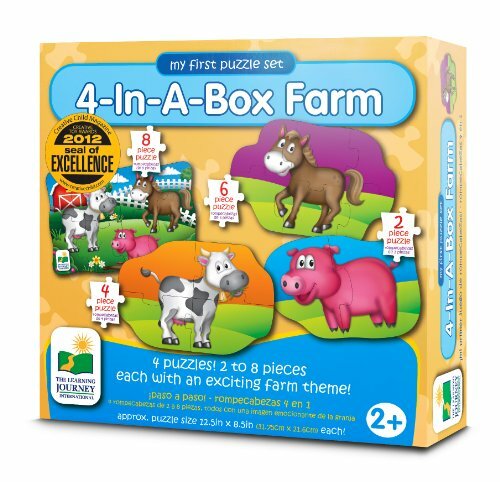 The Learning Journey “My First Puzzle Sets, Farm” is a wonderful starter puzzle for your 2 year old toddler! 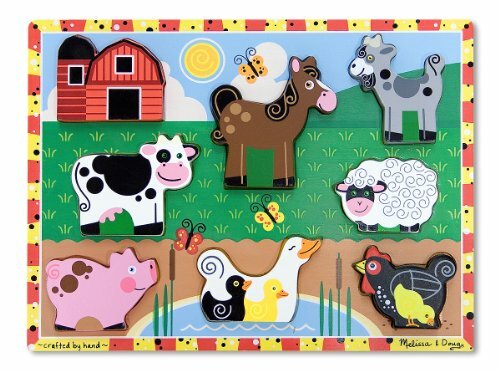 This colorful learning puzzle shows your child what they’d see on a farm, including a cow, a horse and a pig. In addition to the Farm version, there are 7 more great puzzle sets and each set has 4 puzzles with characters that kids can easily recognize. Other themed sets include a numbers theme, a letters theme, a colors theme, a dinosaur theme, a jungle theme, an ocean theme and a shapes theme. So all in all, there are plenty of learning puzzles for your 2 year old to enjoy! Each puzzle set has a different number of pieces, starting with 2 pieces, then 4, then 6, then 8, which is the largest puzzle. If your child does them in order of pieces, the 8 piece puzzle will bring together all the pieces they saw in the first three puzzles of the set. The puzzle pieces are chunky which make them easy for small hands to pick up and manipulate and each completed puzzle measures 12.8″ X 8.5″. The Learning Journey Puzzles make lovely gifts for both boys and girls and are ideal for toddlers age 2 and up. Kids can have tons of fun and learn at the same time! Looking to delight your little one with a visually stimulating animal themed puzzle that makes playtime even more exciting and enjoyment filled? How about the Melissa & Doug Animals Wooden Peg Puzzles Set – Farm, Pets, and Ocean to get your 2 year old bubbling in a world of non-stop learning and entertainment! This sturdy yet attractive 3-in-1 farm, pets, and ocean animals-themed puzzle comes with six easy-grasp pegged pieces that challenge your adorable toddler’s thinking and exercises his or her mind while offering countless ways for them to play. This beautifully detailed, wooden peg puzzle will serve as a launch pad that ignites your little one’s sense of wonder and imagination as they discover themselves, their purpose and their passions. Whether it is the farm, pet or ocean themed puzzle, your child is going to enjoy making up cute stories based on the characters in each theme. Develop your child’s organizational skills by mixing up all the animals in a bowl and have them replace them in each hole and watch as your little one celebrates their accomplishment. Some parents who bought this puzzle mentioned that it is not just a great learning tool but also an efficient way to introduce a toddler to the beautiful variety of the animal world. It’s great value for money as you spend very little on this beneficial learning tool which will improve your parent-child bond with your two year old toddler as you enjoy making the puzzles together. Puzzle is safety tested and approved. 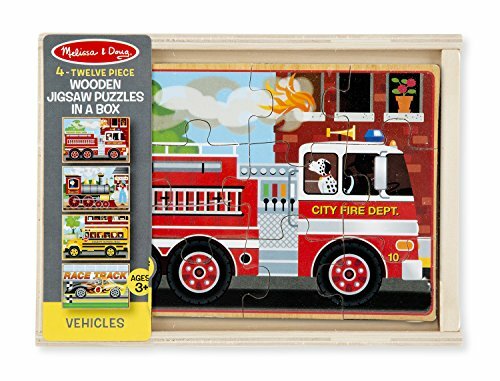 If you want a beautifully designed puzzle that offers a wonderful way for your little one to have fun while developing their physical, emotional, and cognitive skills via role play, imaginative thinking, and storytelling, then the Melissa & Doug Vehicles Wooden Peg Puzzle (8 pcs) is the perfect puzzle for you and your 2 year old. 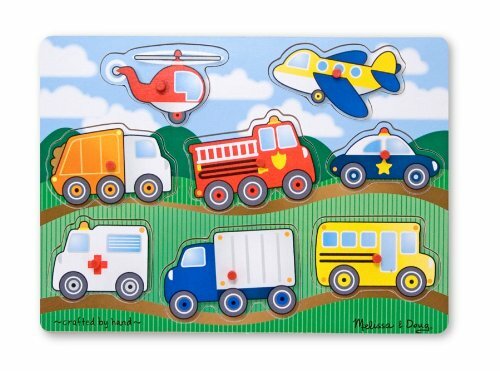 Made of a variety of lightweight carved wooden pieces, this 3-in-1 peg puzzle set features an alphabet puzzle with 26 upper-case letters; a number puzzle which includes 0-9, and an 8-piece vehicles puzzle which includes an airplane, a helicopter, fire engine, bus, truck, police car, garbage truck, and an ambulance. Perfect for children aged 24 months, this early learning peg puzzle with its bright colors will catch your little one’s interest, develop their problem-solving skills and help them learn to think logically. Some parents who purchased this puzzle mentioned that it was great for their preschooler as it helped them develop better color recognition skills and get introduced to the functions of different vehicles. Puzzle offers a great way for your toddler to practice hand-eye coordination, enhance their memory and problem-solving skills – all while having a good time! 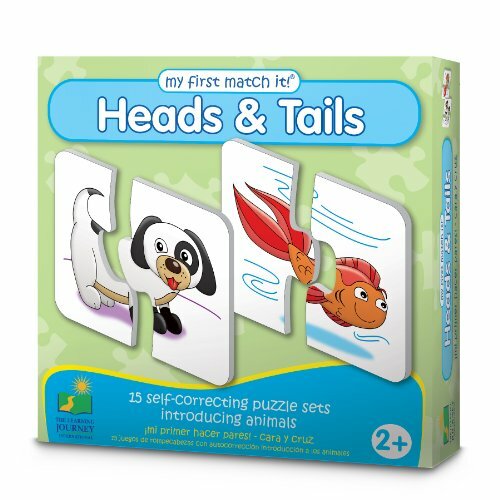 The Learning Journey My First Match It, Head and Tails puzzle set consists of 15 two-piece puzzles that encourage your child to match the animals front end (head) with its back end (tail). The colorful puzzles are large enough for your 2 year old boy or girl to put together easily and small enough to take along on your travels. 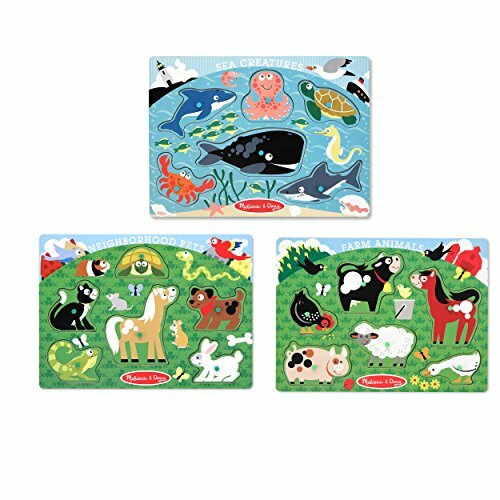 These fun Learning Journey Puzzles feature different animals and they’re suitable for both boys and girls. Guaranteed to keep your little toddler busy and engaged, these puzzles are great to helping your child develop problem solving, critical thinking and fine motor skills. These engaging puzzles make a wonderful gift for Christmas or a special birthday and several parents shared that their kids just loved them! This colorful Melissa And Doug Disney Mickey Mouse Clubhouse Wooden Chunky Puzzle features some of your toddler’s favorite Mickey Mouse characters. 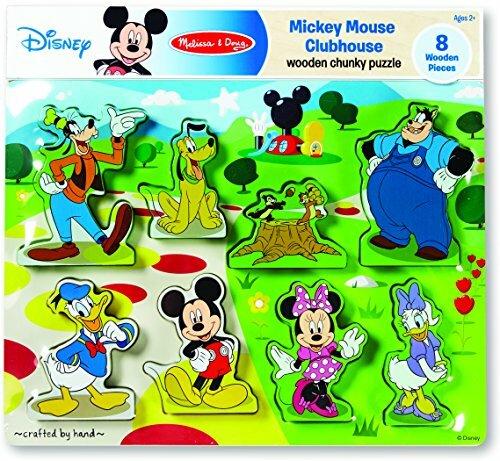 Along with Mickey, your child can also enjoy playing with puzzles pieces of Donald Duck, Daisy Duck, Minnie Mouse, Pluto and other lovable characters from Mickey’s clubhouse. Your preschooler will find the 8 extra chunky pieces easy to grasp and manipulate. With cheerful characters, the pieces of this Melissa And Doug Puzzle are designed to stand on their own so your toddler can play with them outside the puzzle board. The puzzle board itself also has each picture on it to give your little one help in figuring out where each piece goes, should they need it. Ideal for kids age 2 and above, this jolly Melissa And Doug Chunky Puzzle is great for encouraging pretend and imaginative play in your preschooler. Perfect for both boys and girls, this Mickey Mouse Clubhouse Puzzle makes a wonderful any-occasion gift for any toddler on your shopping list. Kids love the cheerful characters on these puzzle pieces! 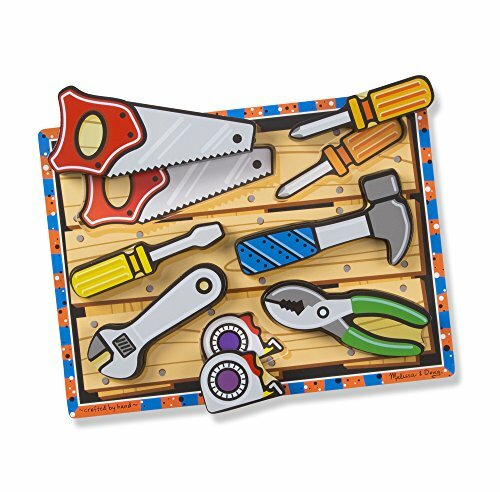 If you have a toddler with an attraction to work tools or you are looking to introduce your little one to simple work tools, then the Melissa & Doug Tools Wooden Chunky Puzzle (7 pcs) is the perfect educational puzzle toolset for your adorable child’s early development. Perfect for children between age 24 months and above, this puzzle is designed to help your little one learn about the different working tools and how each of these components works. With 2 screwdrivers, a saw, a hammer, a wrench, set of pliers, and a measuring tape, this puzzle offers amazing learning and fine motor activities for your toddler. This will help to enhance their knowledge of working tools, their storytelling skills, and their imaginations as well. Your child is sure to get excited at the prospect of playtime with this wonderful interactive puzzle! This extra thick wooden puzzle comes with 7 easy-grasp chunky tool-like pieces with each tool having a full-color matching picture beneath it – all designed to make playtime as fun as it is educational! Some parents who bought this puzzle for their children said their two year olds were instantly attached to this educational puzzle and spent countless hours of pretend play on the puzzle from the moment they saw it. If you are looking for a beautifully designed puzzle that is sure to excite your little one who’s a Minnie Mouse fan, then the Melissa & Doug Disney Minnie Mouse Wooden Chunky Puzzles Set – Dress-Up Activity is the perfect puzzle for you and your little child. This puzzle 8-piece chunky puzzle helps to develop your child’s physical, emotional, and cognitive skills through role play, imaginative thinking, and storytelling. 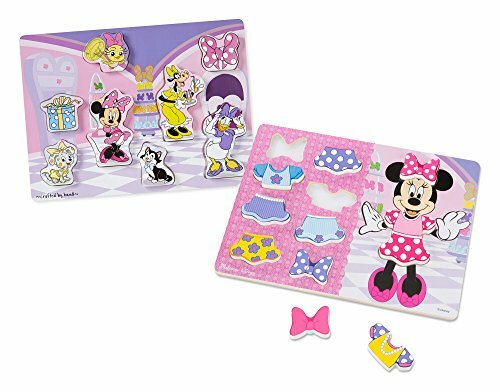 Made with extra-thick wooden pieces, this 11-Piece dress-up puzzle would have your little one mixing and matching stylish outfits for Minnie. Suitable for children age 2 years and above, this cheerful playset which features matching pictures underneath every piece for simple matching. It is easy to grasp and maneuver, and even stands up for pretend-play excitement thus making it the ideal puzzle for small hands and big imaginations. Some parents who bought this beautiful puzzle mentioned that the design, bright colors and the Minnie Mouse theme of this puzzle continue to stir their kid’s imaginations and the little one just cannot get enough! Take your adorable little toddlers playtime to a heightened level of fun, excitement, and enjoyment with this portable travel-friendly Melisaa And Doug 4-in-1 Vehicle Wooden Jigsaw Puzzle. Designed to promote your cute little 2 year old’s hand-eye coordination, fine motor, and problem-solving skills, this 12-piece puzzle is the best gift you can give your child today. Your toddler has 4 different puzzles to choose from: a fire engine, a school bus, a race car or a steam train engine, making it perfect for boys and girls. Your child can have fun putting any of these puzzles together on their own, or they can enjoy making them with their friends or siblings. Made from wood, the pieces are the ideal size for tiny hands, making them easy for your two year old to manipulate and put into place. The puzzle set comes in a strong wooden box with a separate compartment for each puzzle making it handy and easy for storage. Fun themed puzzles that 2 year olds love and enjoy! Already got your two year old toddler a puzzle gift and now looking for something more than just a puzzle? How about this classic Farm-Themed Melissa And Doug Wooden Chunky Puzzle Playset with 8-pieces that can be played with separately? The eight-pieces include a barn, a cow, a hen with a little chick, a pig, a sheep, a duck with ducklings, a goat and a horse. Your toddler can use any or all of these pieces on their own for pretend play, creating their own stories and adventures. The pieces are made from wood and they will actually stand up which kids love as they can create their own little world but still make the actual puzzle. Puzzles are great for 2 year olds, and this chunky farm puzzle is no exception. They help improve your child’s hand-eye coordination, creative expression, and fine-motor skills, as well as their zeal for problem-solving. If you’re looking for a great gift idea for your toddler, then this wooden farm themed puzzle is perfect! Fun filled puzzle with a farm theme that your child will love!